The removal of carboxyl groups and the release of alkyl radical fragments from the tight binding of carboxyl groups are promising directions in organic synthesis, especially in drug synthesis. Various catalysts have been designed to solve this challenge. In a recent study published in Science, researchers from University of Science and Technology of China (USTC) of the Chinese Academy of Sciences reported their newly developed catalyst system, which is cheap and simple. 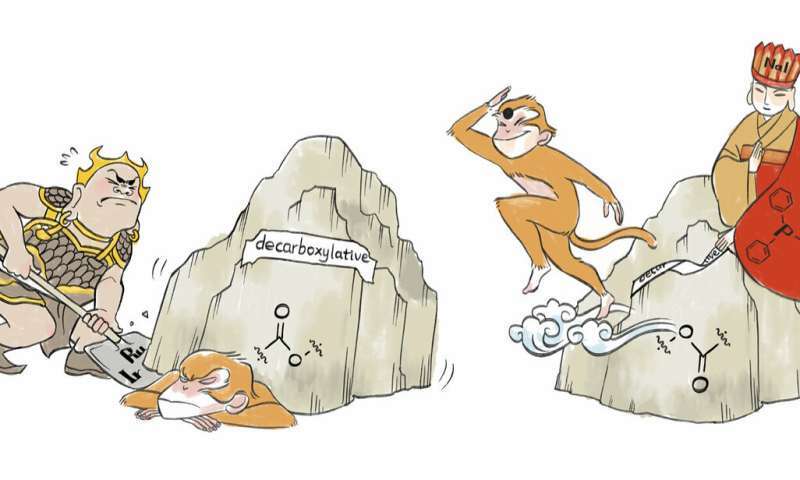 The free radical is versatile and controllable, representing the "Monkey King" of organic synthesis, but it is pressed by the "big mountain" of the carboxyl group. Conventional decarboxylation processes have limitations in industrialization. In recent years, the scientific community has tried to use photocatalytic reaction to achieve decarboxylation conversion, which has adavantages such as simple operation, easy control, and energy saving. The photocatalytic system has been successfully applied to the synthesis of various complex functional molecules. However, most photoredox catalysts in current use are composed of precious metal complexes such as iridium and ruthenium or are synthetically elaborate organic dyes with complicated structures. It is important to develop environmental friendly and multifunctional photocatalytic systems. The new catalyst has a new way to use the new mechanism to combine cheap catalyst with carboxyl group, push redox reaction cycle, and easily and freely rescue the "free radicals." Based on visible light excitation for intermolecular charge transfer, scientists from USTC proposed a new concept to construct a catalytic redox cycle for organic synthesis. They discovered a simple, easily available, highly efficient and non-metallic anionic composite photocatalytic system for decarboxylative reaction of carboxylic acid derivative. The proposed catalytic system simultaneously drives a redox cycle, simplifies the photocatalytic system, and reduces the cost of the photocatalyst. The system breaks the limitations of traditional heating method, and solves the problems of transition metals remaining in the synthesis of functional compounds and drugs. Using this system, redox-active esters derived from various natural and unnatural amino acids successfully trigger decarboxylativr coupling reactions with high efficiency and gram scale production, indicating the feasibility of industrialization. It is also expected to promote the scale industrialization of photocatalytic technology in the production of important functional molecules, with important synthetic chemical value and good industrial application prospects. The results may initiate a new area of research in photoredox catalysis by introducing a tricomponent system based on a salt, a phosphine and an electron- acceptor to access redox active complexes without the need for traditional transition metal or complex dye catalysts. This study illustrated that decarboxylative alkylation is accomplished without precious transition metals or organic dyes, which may be good news for many synthetic chemists.